PROJECT CONCEPT A well-planned modern townhouse community of elegant residential units inspired of Spanish and Southern Californian architectural style. Owner I Developer : Cathedral Heights Holdings Inc.
General Contractor : DHN Construction and Development Corp. Plumbing : Integrated Contractor Plumbing Works Inc.
1 BEDROOM : 89.48 sq.m. 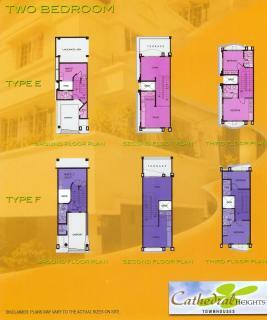 to 98.30 sq.m. 2 BEDROOMS : 144.80sq.m. to 254.30 sq.m. 3 BEDROOMS : 194.99 sq.m. to 259.06 sq.m. - Provision for Water Heater at Master T & B, common T&B (3rd floor) and Kitchen.